will cease transmissions of shortwave. In the footsteps of Radio Bulgaria!! the coming days should change the time of transmission: 1500-1630 on 7515. 1900-2100 on 7530 ERV 100 kW / 065 deg. First noted on April 1. 1300-1500 on 9390 EWN 250 kW / 355 deg to SEAs, cancelled for maintenance! *til 1200 co-ch WYFR Family Radio in Tagalog via Paochung, Taiwan! Today it is exactly 65 years ago that Radio Netherlands Worldwide began its activities as an international broadcaster. A lot has changed over the years, so time to look back. On 15 April 1947, RNW was set up by the Dutch government. The new foundation was charged with “putting together and preparing radio programmes to be received outside the borders of the Netherlands” and began broadcasting in Dutch, Indonesian, English and Spanish. In the early days RNW had a ‘Greetings Department’, since making phone calls across the globe was difficult and very expensive. RNW also broadcast news, current affairs and cultural programmes. The broadcasts of this period reflect the post-war reconstruction phase. In 1949, broadcasting started in Arabic and in Afrikaans for South Africa. In 1950, a new department was set up to compile radio programmes and distribute them to foreign stations. At the same time music activities were begun by way of partner stations abroad. RNW also gained an important new target group: Dutch emigrants in Australia, New Zealand and Canada. In 1952, RNW began broadcasts aimed specifically at them. In 1964, RNW’s music department was one of the first in Europe to make music recordings in stereo for foreign FM stations. The Radio Netherlands Training Centre was set up in 1968 to train radio personnel from developing countries. A French department was opened in 1969 and broadcasts in Portuguese to Brazil began in 1974. In 1975, there was a review of the programmes broadcast on short wave: a stronger emphasis was placed on news and current affairs programmes. In 1991, RNW became the first organisation in the Netherlands, apart from the Dutch PTT, to be granted a licence to broadcast programmes directly by satellite for radio stations in Latin America. This was followed in 1992 by collaboration with local radio stations in Latin America. In 1994, RNW began working together with domestic broadcasters on the exchange and co-production of programmes. An RNW office was opened in West Africa in 1995 to serve listeners in the region via local radio stations. Today RNW provides independent information and background reports in countries where press freedom is not a matter of course. This means that millions of people around the world with little or no access to information can enjoy reliable and impartial reporting. News about their own country and their own situation, as well as international news from a Dutch perspective. RNW operates in ten languages (Arabic, Chinese, Dutch, English, French, Indonesian, Papiamento, Portuguese, Sarnami and Spanish) on short wave, satellite, internet Facebook, Twitter, Apps and partner stations all over the world. From 2013 everything will be changing. Last year the Dutch government decided to cut back RNW’s budget drastically. In future RNW is to limit its focus to providing impartial information to people in countries where press freedom is an issue. For a small group of RNW employees this will be a new challenge. Sadly, for the majority of the staff and for a large part of our audience this will mean the end of an era. Stuff they don't want you to know - What are the numbers stations? 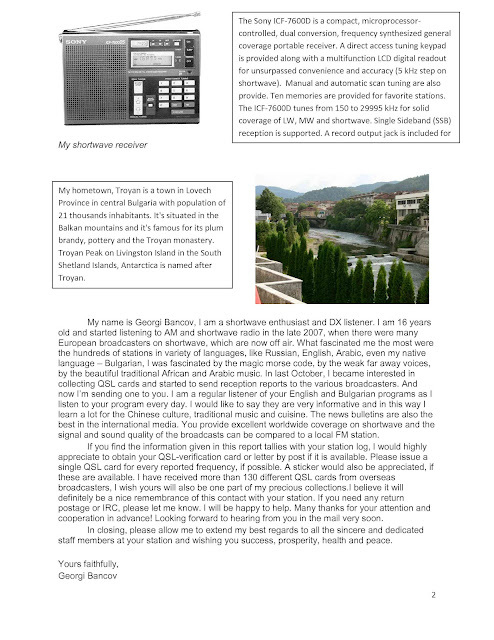 The reception report was emailed to the English department of China Radio International: crieng@cri.com.cn ! 1. Include as many program details as you can. 2. Include program comments - stations love to hear about themselves. 5. Don't lie, if the reception was poor, tell it. If the program is not interesting to you, give some advices for improving it. Hope this helped you. 73! Contact was made with the station manager. Email was sent to: fils_ngana@yahoo.fr ! I am a shortwave listener from Bulgaria, a small country in South Eastern Europe. I frequently tune to your broadcasts on 6165kHz to learn a bit about your home country. The traditional music from Chad is wonderful and I can listen it for hours and hours. Do you provide sending cards and pictures of the radio station to listeners? I'll send you a reception report along with money (USD dollars) to your postal address, is it possible to send me some brochures and information about your country and your radio station? I want to learn more about them. Let's keep in touch. It's very kind of you for this report. Thanks. You know, about brochures and others you like to send US Dollar, ok but let me give you an other adress because many of those kind of correspondences were lost. So, please get here the safety adress: Dingamtoudji Ngana Esaie, EET N12. P.O Box 4012, Ndjamena/Tchad Tel +235 62363237. My email adress is the same. Spending cuts announced last week in Canada's latest federal budget have reached Radio Canada International. Speaking to employees at RCI's headquarters in Montreal on Wednesday, RCI director Helene Parent declared that two out of three RCI employees, about 40 people, will lose their jobs by the end of July. RCI's Russian and Portugueuse sections will be closed along with the English and French-language newsrooms. All shortwave broadcasts will cease as well. RCI will continue to exist solely on the Internet in five languages - English, French, Arabic, Spanish and Mandarin. What a pity, let the RCI staff to expect their audience to reach 0%. Another international broadcaster is dying. 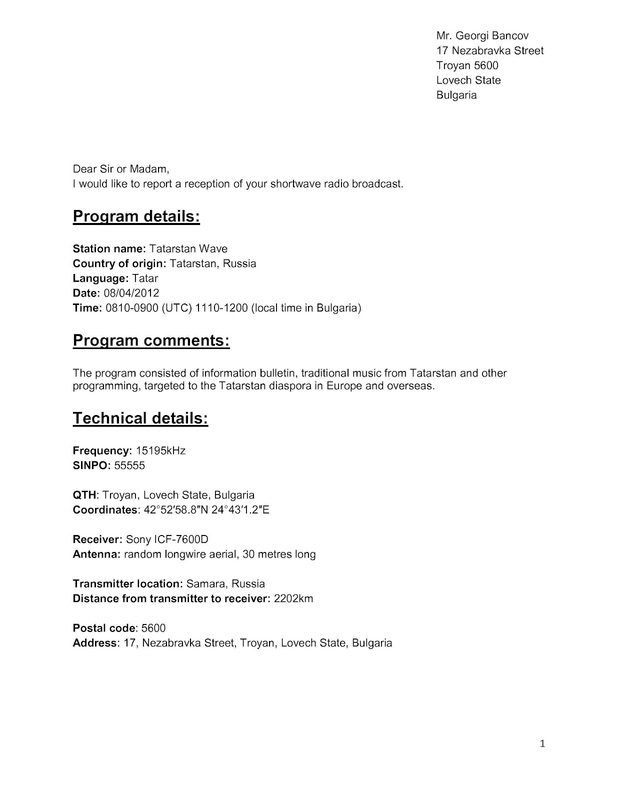 Radio Budapest, Radio Ukraine, Radio Sweden, Radio Norway, Radio Bulgaria, Radio Finland, Radio Denmark, Swiss Radio International, RAI International, Radio Prague, Radio Slovakia, RTBF Belgium, Radio Vilnius are now off the air, some no longer exist. 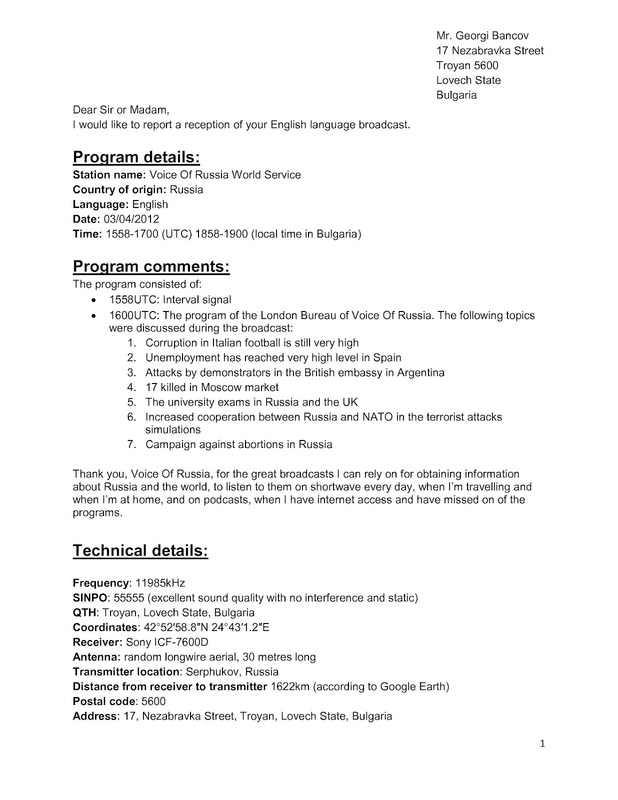 Polish Radio External Service cut its English language broadcasts. 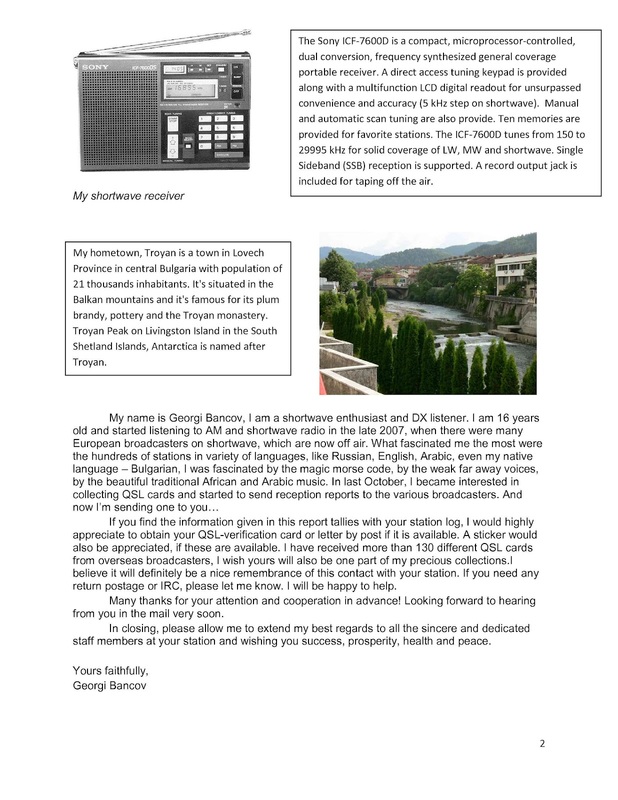 The only remaining shortwave facility of Deutsche Welle is located in Rwanda, Radio France International is going to cease all shortwave transmissions in 2013. Radio Netherlands' facility in Bonaire to be closed in the November 2012..Who's next? What the shortwave spectrum is going to look like in the next few years? Please, comment! Tonight's edition of "What's Up?" confirmed that Polish Radio External Service in English is dropped from shortwave from start of A-12 Season. Only available on Internet, satellite & via WRN from 25 March 2012. Another shortwave broadcaster slowly disappearing from the HF spectrum. The remaining shortwave broadcasts from Poland are in Belarusian, Polish and Russian, all via Woofferton. 0530-0557 on 9700 17760 21500 11875! The program consisted of ance and pop music selection with several breaks for announcements, contact information and reading reception reports. The program started a few minutes after 0930UTC with rock songs and instrumentals. The signal peaked at times, but was unstable. Station name and contact information took place several times. 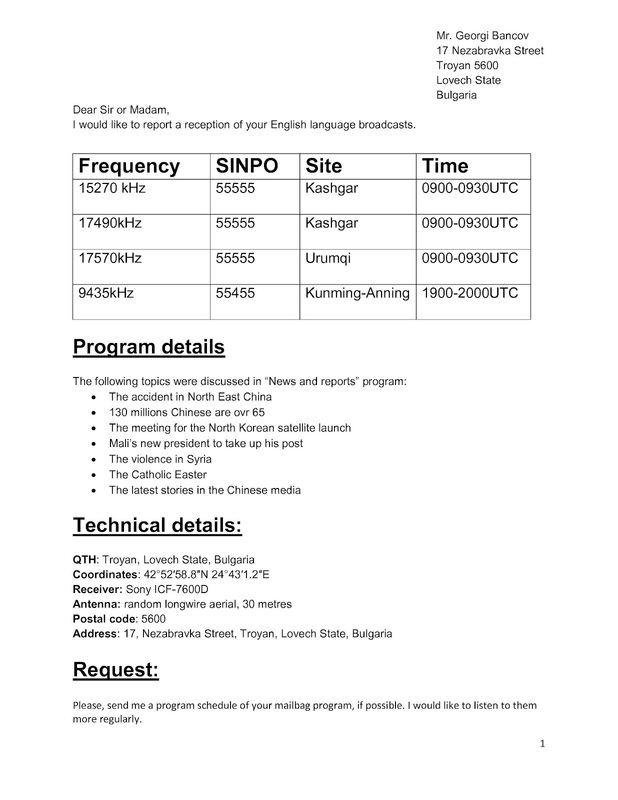 The program started at 0900UTC. It consisted mostly of rock and rock’n roll music, as well as frequent announcements of the station name and reading reception reports from listeners. The signal faded at times, but the modulation was great and audio clear and easily understood. The first station to hear today on the 19 meters band. Various styles of music were played. Listeners letters and reception reports were read, as well as frequent station IDs and contact information. The program consisted of techno and dance music, as well as pop and hip-hop. There were frequent station identifications during the broadcast and the announcer welcomed reception reports seve ral times. Deep fades during the broadcast. The program was observed after 1100UTC. During the broadcast were played songs of various music styles, like Polka and Heavy metal. The broadcast went off the air after 1130UTC. 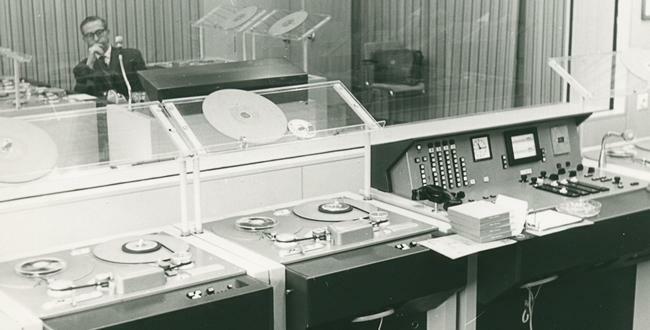 The five-minute broadcast consisted of weather bulletin, provided by the Municipality of Monaco, read in French language by male announcer, followed by frequency schedule and contact information, read by software synthesized female announcer. US Air Forces, coded message, read by software synthesized female voice.